Note from Jane: The following post is the first in a series that will offer tips and advice from successful authors about self-publishing, specifically those who use Barnes & Noble’s Nook Press as part of their overall sales, marketing, and distribution strategy. This series is sponsored by Nook Press, which means they have paid for these posts to run on my site. However, because I do not pay my guest bloggers, I am using the sponsorship money to pay these authors for providing guest posts. I think it’s a win-win for everyone—for the authors (they get paid), for Nook Press (they get attention), and for me (because I like to pay writers for their content whenever I can). First up in the series: Colleen Gleason (@colleengleason). Keep reading for her insights. One of the best things about working independently with NOOK is that I can change the packaging and positioning of my books at the drop of a hat. I can test things out with readers to see what sorts of covers and book descriptions work better than others. 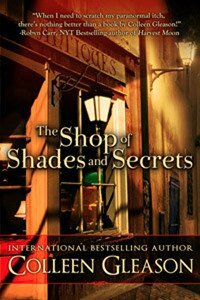 Recently, I did a repackaging—for the third time!—of some of my romantic mysteries/gothic romances: The Shop of Shades and Secrets and The Cards of Life and Death. This isn’t the first time I’ve changed my covers, but this is the first time I’ve made such a radical change. (When I repackaged my medieval romances, I stayed with the same sort of look—just different models and colors.) I spent a lot of time trying to figure out why these books weren’t doing as well as I thought they should, given the reviews and responses from readers and editors alike. Originally, the covers looked more like a traditional gothic mystery cover—like a Barbara Michaels, Antoinette Stockenberg, or Mary Stewart book, with mysterious looking houses and dark colors. There is a ghostly/supernatural element to both books, so I thought that would be a good way to showcase that element. Those covers were beautiful, but didn’t seem to capture the attention of the market I was trying to reach: the romance market. So I had the covers tweaked to showcase the couples/romantic element. However, the sales still weren’t where I thought they should be, given the positive reviews and excellent feedback from readers. So I started asking people—readers and other authors—what they thought about the covers. I was surprised when several people told me they thought the covers were too dark and scary looking—that the books were funny and witty, and the covers made them look too dark, especially with a title like The Cards of Life and Death. I knew that humorous mystery and romantic mysteries were doing quite well in the market, so I started looking at the covers of those successful series. I realized that with titles that sounded so dark and ominous, I needed to have a cover that indicated the lighter elements of the stories. I found a cover artist who actually read the books before she began to work on the covers. (She also has done covers for other humorous/romantic mysteries.) She was able to bring in several important elements to a fresh, new design: the lighter colors, a more humorous feel, and something that had been missing before—the animals. In both books, there are cats (plus a dog in one) that are critical to the story. As one might expect, it took me a while to find this designer who could come up with a fresh enough concept for the repackaging. When I initially hired a designer to do the third versions of the covers (another designer did the initial two versions), she wasn’t able to come up with a concept that fit the story, and so we parted ways. It took me another couple of months to find another, who did this final, bright, fresh version. over the last few years. I use a variety because after looking at their portfolios and work samples, I can see what type or genre each artist does particularly well. Since I write in a wide variety of genres (from historical to post-apocalyptic to erotica), when I have a project that needs a cover, there’s usually one particular artist who fits best. I also change cover artists when I’m looking to repackage a book, to give it a set of fresh eyes. When selecting a cover artist, not only do I look at the actual cover images that have been created, but I also pay attention to the artist’s use of typography. I discuss this at length in a chapter of The Naked Truth About Self-Publishing (The Indie Voice LLC, 2013), but let me say here that to me, excellent typography is probably even more important than the cover image. Good typography—meaning the correct use of fonts as well as layout—is the mark of a professional cover designer, and one that sets amateur covers apart from excellent ones. My cover design costs range from $100 to $600, though it’s not unusual or unreasonable to pay more. The cost depends on what you’re looking for, how well known the artist is, and whether you want just the front cover or the spine and back. Some artists charge extra for the stock photos they use as well. And if you’re like me and really get into the font choices for a cover, you might have to pay extra for a specific font. All this work was completely worth it to me, however, because I love the new covers for my gothic romances and my readers seem to also. Sales have increased several hundred percent over the last month since I unveiled the new look (complete with some advertising and social media support). Posted in E-Books, Guest Post, Marketing & Promotion and tagged book design, self-publishing. Colleen Gleason is a New York Times and USA Today bestselling author with more than twenty books in print. Am I reading the Publisher’s costs wrong on their FAQ, where they stipulate a 40%-66% royalty? If this is so, is that an industry standard charge? If you’re speaking of NOOK Press as the publisher, first of all, they aren’t a publisher. They’re a distribution system. You (or whoever uploads your work) is the publisher, and you retain the rights to the work. NOOK pays about a 65% royalty to the publisher–to you, the person retaining the rights and formatting/uploading the books. Hi Terry – See response to Colleen Kelly Mellor for more. But Colleen Gleason, how did you identify artists, in the first place? I first joined LinkedIn (trying to see there whose work I might like), then was inundated by children’s illustrators as forum group and found myself not reading anything after a while because too much was coming across my in-box. Is there any marketplace that shows artists’ samples, so I can glance over, in seconds, to see what I’m looking for? This, I find, is the biggest bug-a-boo to my time constraints.How to get what I want in the shortest time. Colleen will probably jump in here, but KindleBoards (kboards.com) is often recommended in the indie community as place to look for cover designers; I believe they have a thread dedicated to this. You might also try Sortfolio (http://sortfolio.com) and Bibliocrunch (http://bibliocrunch.com). I so appreciate this help…You’re all like a divining rod, in the self-pubbing world. Thank you so much!